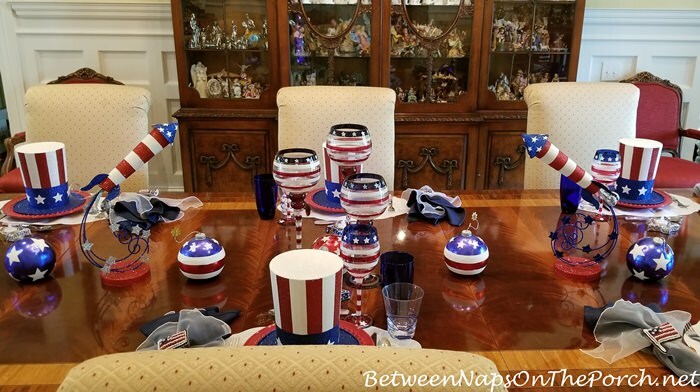 Welcome to the 510th Tablescape Thursday! 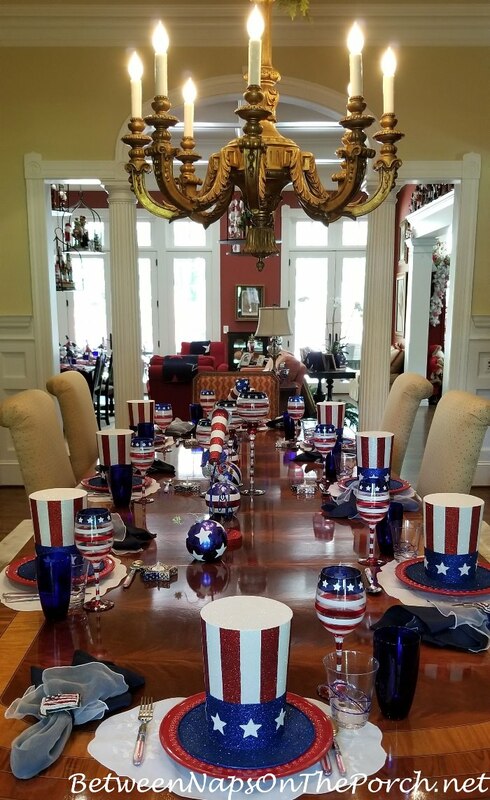 It’s always a big celebration at Marie’s for the 4th of July! She had several tables set and ready for friends and family when we met up last week. I love these Uncle Sam hats! They make such a fun statement on any table or in any centerpiece or decor. Marie found those in Pier 1 a few years back. 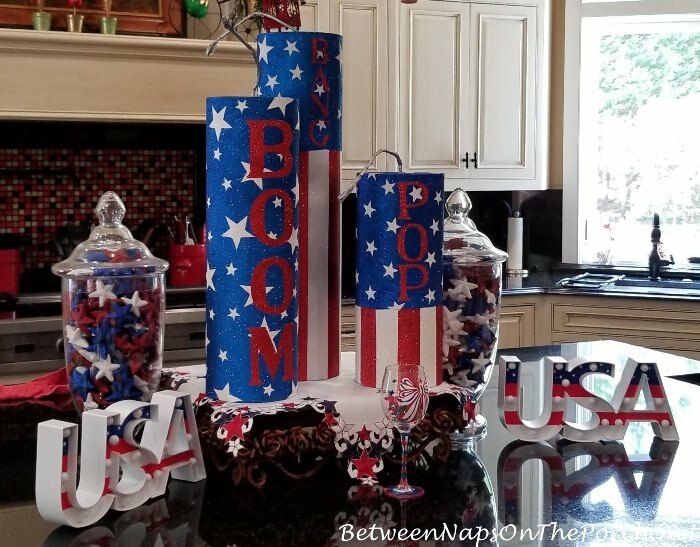 A mix of tall, glass candle holders mixed with shorter candles and patriotic striped rockets created a fun centerpiece for this 4th of July celebration table setting. I love Marie’s beautiful flame mahogany dining table! Seriously gorgeous! Here’s another view of the tall candle holders Marie used in the centerpiece. I wish Pier 1 still had these tall “Uncle Sam” hats. I don’t see them on their website this year. 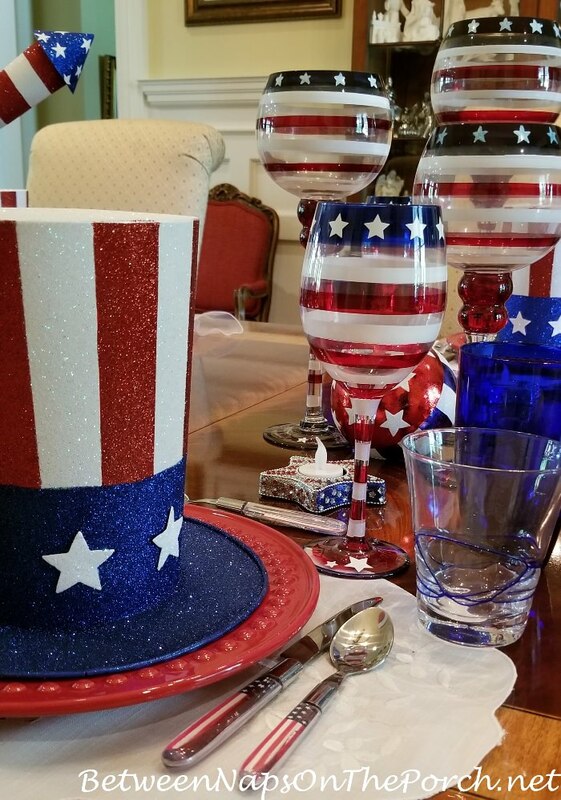 Patriotic flatware found in HomeGoods completes this festive place setting. 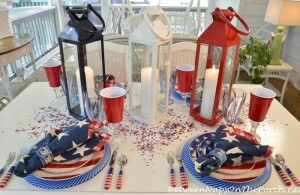 Love the flag stemware! I think Marie found it at Pier 1 a previous year. They didn’t have this pattern this year, but they do have some really fun patriotic stemware on clearance. You may remember the centerpiece Marie created for her kitchen island shared in a previous post. Do you see the glass there on the counter? It had just arrived the day I was visiting. 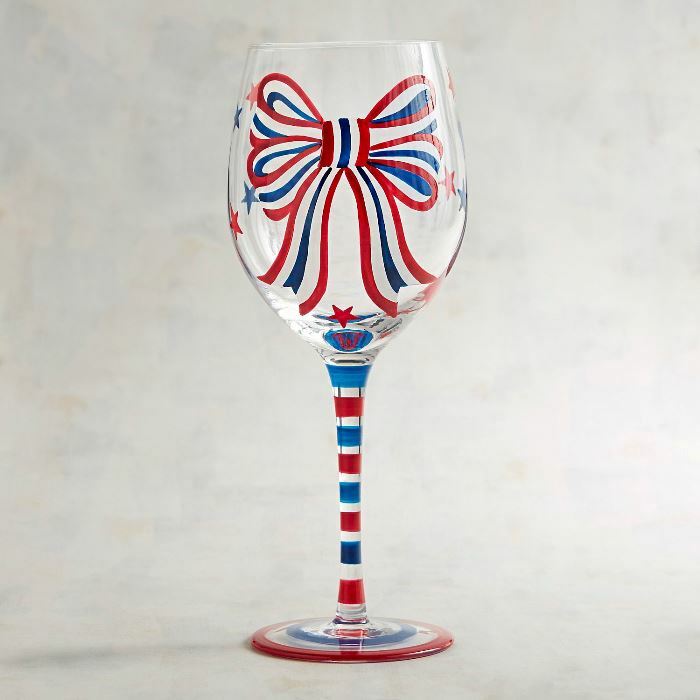 It’s currently half-off on clearance now, you’ll find it here: Stemware for Patriotic Holidays. There are some awesome deals in their clearance section! 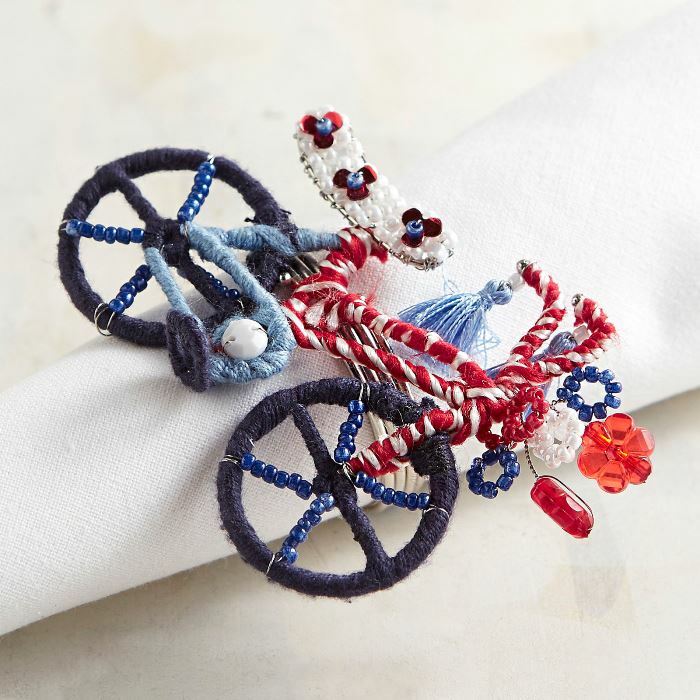 I noticed the bicycle napkin rings I used recently are half off, you’ll find those here: Bicycle Napkin Rings. I’m tempted to buy a few more! You can see all the Americana-4th of July goodies that are currently on sale here: Americana. 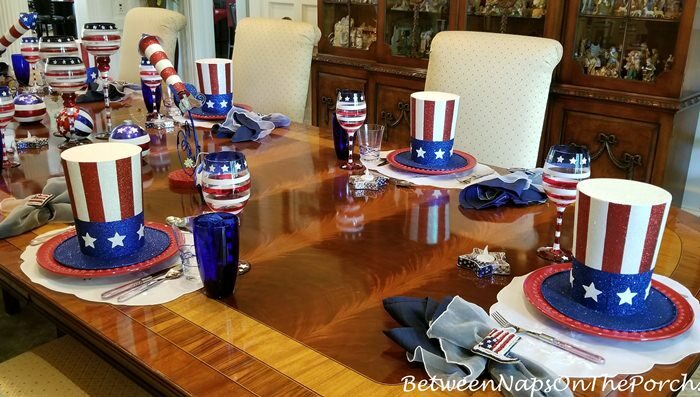 Thanks so much to Marie for opening her home to us and sharing this wonderful table for this week’s Tablescape Thursday! 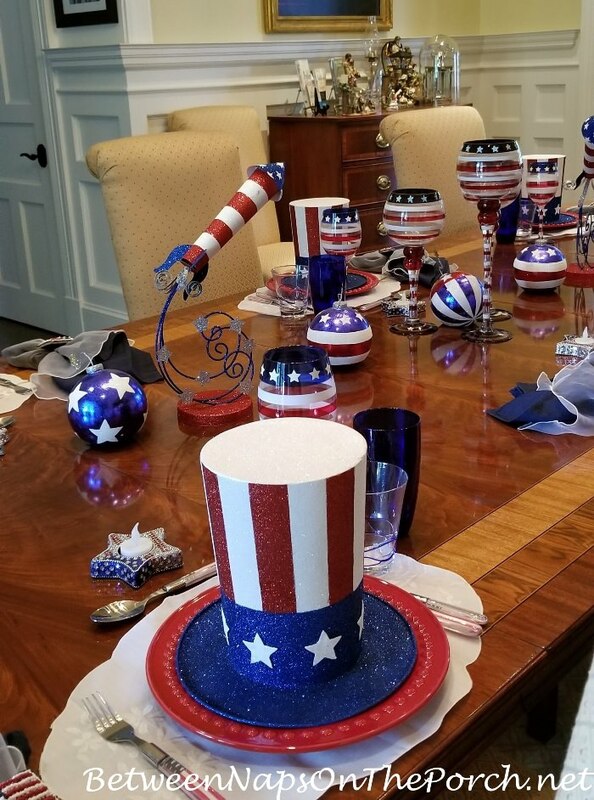 I just adore the hats, the goblets and the flatware! What a striking table. You make July 4th so fun! Love Marie’s clever and enthusiastically energetic love of holiday decorating! Did you happen to ask where the firecrackers from her kitchen island came from? Love them – thanks! Susan, thanks for having us in. I followed through on the napkin ring holder that one of your readers suggested, and am passing along the tip to my readers with a link back. Great idea, thank you! The link through email landed me right where it should – success! 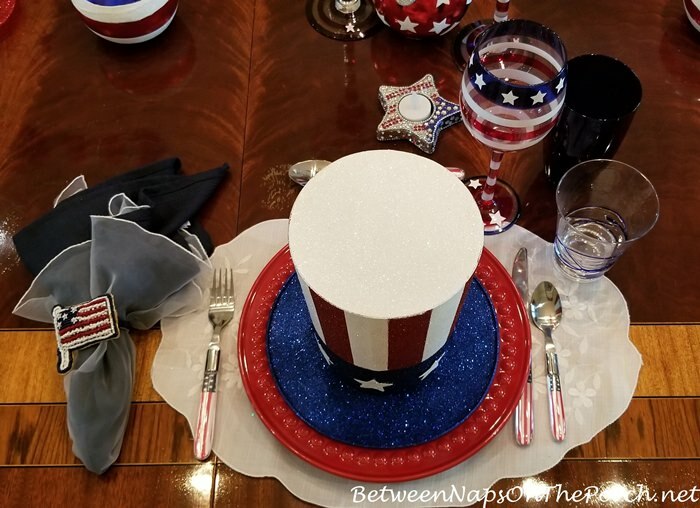 Those Uncle Sam hats are the stars of the table! 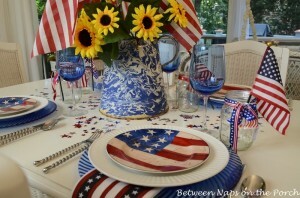 And what a nice touch with the patriotic flatware. (Someone needs to invent some sort of fairy fireworks for tabletops). What a fun table! 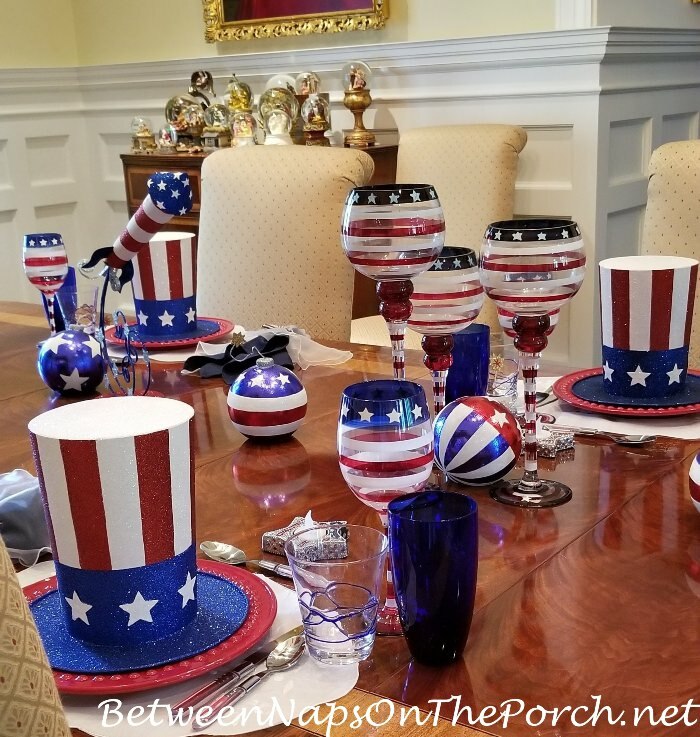 The hats are perfect as focal point, but all I wish I had are those great looking, patriotic stemware… Love them ! Hope you are having a terrific 4th. of July week. 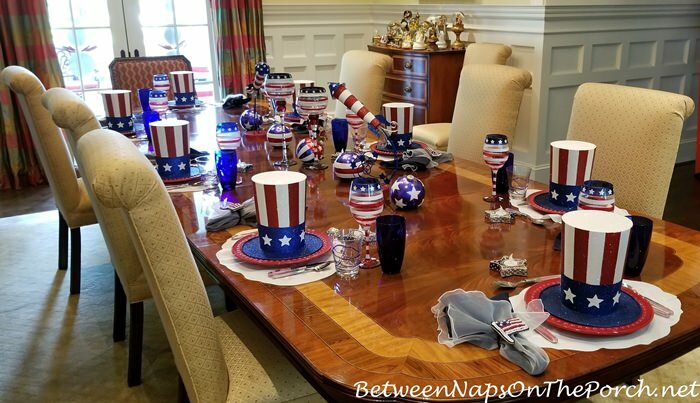 Always LOVE Marie’s decorations and tablescapes! Any chance you will be showing the other tables she had set in a future post? 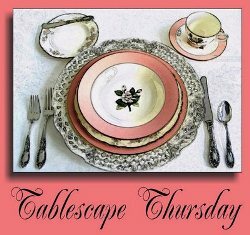 Could you please walk us through exactly step by step how to link to the Tablescape Thursday. I am a newbie and don’t understand what you are saying. I suspect others have the same problem. Marie’s tables and home is always decorated beautifuly . I was wondering if she had help with putting up all the decorations or if she did it herself. Love this! It isn’t all cutesy, just really nicely done! LOOOOVE the wine glasses! I am going shopping now via the link you gave us. Thanks!!! I didn’t get to post my table this week so I’ll join the party tomorrow or next week. Those Uncle Sam hats are everything! Thanks for hosting and I hope you had a fun and relaxing holiday. 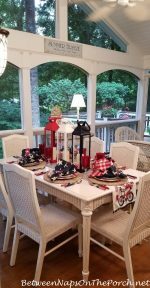 I can just hear the excitement of the guests invited to enjoy the holiday sitting around that fun, gorgeous table. Agree that after the holiday is the time to buy that pricey seasonal stuff. 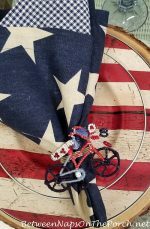 Today, I found patriotic bows for my bike, U.S.A. sparkles and some headbands all for under $6. Hope you had lots of fireworks! I recently purchased the flatware and I love it. I am also using the napkin rings you showed us how to make, the rosette with the red, white and blue ribbon with the star in the center. So cute! I really enjoyed making those and they turned out well. When I see them I think of you. Hope you had a great holiday, Susan! Always appreciate Marie’s decor, love her spirit. How she does it I can not imagine. I would have to have coffee hooked up to an IV pole that I roll around in order to do what she does.